University and community organizations are pushing for the state Legislature to enact a tuition freeze. Various organizations rallied on Library Mall and at the Capitol Wednesday, expressing their displeasure with Gov. Scott McCallum's budget proposal. Speakers ranging from members of the Justice Education Diversity Initiative student government slate to the local American Federation of State and County Municipal Employees chapter spoke at the rally and supported their causes. Randy Brink, executive board member of AFSCME Local 171, said students and workers have many common issues, including alleged limited-term employee abuses on campus. Brink said since student tuition pays for LTEs, students are adversely affected when LTEs lobby for increased pay. He said if the jobs were to become full-time positions, the state would be responsible for the wages. "Essentially, the university is taxing students to weaken our union by holding positions as non-civil service jobs. We are not blaming LTEs," Brink said. "We want them to receive full benefits and fair wages. If this happens, it will ease tuition [difficulties] for students." The rally moved from Library Mall as protesters marched down the center of State Street, impeding traffic as they walked to the state Capitol. Multicultural Student Coalition member Jayson Pope said McCallum's current budget proposal drastically under-funds programs for minority and disadvantaged students. He said Plan 2008, which aims to make the university's population representative of the state's, would suffer greatly under the current budget proposal. Raul Islas, who helped organize the rally for the Student Labor Action Coalition, said the goal for Wednesday's event was to promote inclusion and diversity, as well as unity among students and university employees. Islas said tuition does not necessarily rise because workers want a raise; he said the state government's budget allocation misused public funds. "The budget is not tight. It's irresponsible spending [that makes the budget appear tight], and we want to balance that budget," Islas said. "The governor's budget is an attack on the public, using public money to empower corporate interest, and it does this at the expense of the public interest." SLAC held the rally Wednesday to honor the anniversary of Dr. Martin Luther King Jr.'s assassination. On the day of his assassination King was protesting for sanitation workers who were part of AFSCME. Islas said that SLAC coordinated the tuition freeze rally along with AFSCME because "racial and economic justice issues are tied together ... [and] we lose when we're divided." 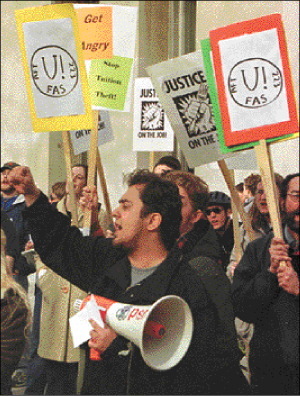 "When we unite and see how students and workers are being exploited by the university that is when we'll succeed," Islas said. UW-Madison freshman Lisa Barnes said she saw fliers around campus and came to see what the rally was all about. "I think education is important to everyone, and we should all have the ability to get an education. High tuition makes this impossible," Barnes said.